If you have never played with a caddie before, the experience can be a bit daunting to begin with, however you soon realise that they are there to make your round that bit more enjoyable. 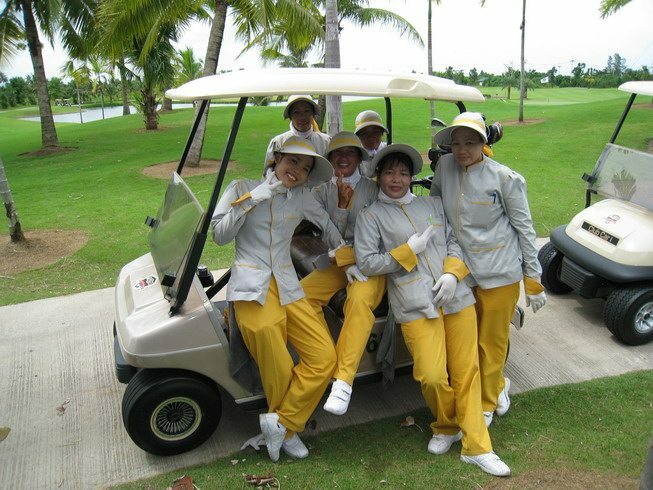 Most of the caddies in Thailand are female aged between 18-25yrs old and they make their living by caddying 4-5 times a week. The golf club normally charges the golfer a caddie fee of Baht300 (8 Euros) and then it’s up to you to give them a tip at the end. If you ask you caddie how much, the normal response is ‘It is up to you.’ Baht 300 (8 Euros again) tip for 18 holes is the norm, although if you go round in a low score or get a hole in one, then feel free to increase the tip in proportion to your enjoyment. Not only are the caddies often very pretty and fun to be with, they know each hole as they often golf and they see everyone play the course all year round. So as a Thailand golf holidaymaker it is best to take your caddie’s advice on where to aim from the tee box, and how to read the greens. Most caddies have nick names like Beer, Fat, Oil or Shrimp. (No Joke!) So easy are they to remember, feel free to use their nicknames throughout your round! At the end of the round, your caddie will ask you to count your clubs before taking them back to your car. They will often give you their ID card with their name and number on. You then can slot it into the evaluation box marked good or excellent! If you liked your caddie, make a note of her number, in case you return and want the club to book her for your second round there. Just another reason why playing “Golf In Thailand Always Amazes You”!